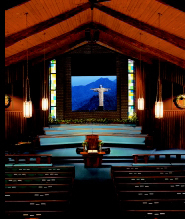 Heavy-duty electric screen�For big-screen presentations. Quiet, dependable operation. 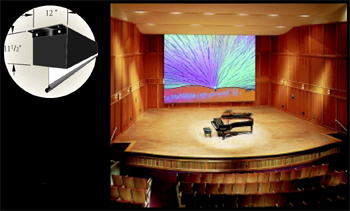 The Rolleramic comes in sizes through 20' X 20' or 25' diagonal to accommodate your biggest presentations. All-wood case may be recessed in the ceiling or painted to match its surroundings. Custom built of the finest components to fit your requirements. The viewing surface is concealed when not in use; lower it to any position at the touch of a switch. The drive module is mounted on rubber vibration insulators for smooth, quiet operation. Fiberglass matt white, glass beaded, or Panamax viewing surface. Extra Drop- Up to 20' overall height, either white or black. Black Masking Borders-Borders are standard on Video, HDTV, and WideScreen format screens. Available by request on AV format screens. Triangular Shaped Steel Slat at bottom of projection surface. With screen recessed above ceiling, the triangular slat can be set to stop flush with the ceiling, for a clean installation. Projected Mounting Brackets- 6" clearance for wall-mounted equipment below screen. Control Options - Refer to page 19. Mounting Brackets - Universal brackets for wall or ceiling mounting included, of �. thick strap steel.Two brackets furnished for screens to ... wide; . for larger screens. The Rolleramic can also be installed above the ceiling line. audiences. Case of aluminum and fire-retardant hardboard can be suspended anywhere, with controls wherever they’re needed. Extra Drop - Up to 21' total screen height, either white or black (White standard on AV format screens, black on all others). Black Masking Borders - Borders are standard on Video, HDTV, and WideScreen format screens. Available by request on AV format screens.